History of Russian coat of arms originated in the distant 1497. The first image of the eagle appeared on the seal of Ivan III. Since then, the symbolism of the Russian state has undergone significant changes, but the essence of it, the interpretation of the images on it and its value virtually unchanged. Initially, in 1497, on the coat of arms of the Duchy of Moscow was shown the double-headed eagle and rider, who fights with a dragon. The eagle is the symbol of the Byzantine Empire, which came to the Russian land, together with the Princess Sophia, which had married Ivan III. Each of the monarchs brings changes to the pattern on the coat of arms of the Russian state, but significant changes refer to the time of the reign of Alexander I. with his light hand, according to historical records, the eagle spread its wings and in its paws appeared the thunderbolts, a torch and a wreath of Laurel. Finally the coat of arms of the Russian Empire was created in 1885. It was then that it appeared three crowns that rise above the heads of the eagle, and he had two options – Big and Small. Moreover, this emblem is considered now the most difficult of all, in terms of reading and in terms of the value of the figure. Many contemporaries wonder about what symbolize the three crowns on the coat of arms of Russia. According to the interpretation, related to 1625, they symbolize the Union in a single state Astrakhan, Siberian and Kazan kingdoms. In addition, they have become a symbol of the Holy Trinity and the three virtues of the Christian values of Faith, Hope and Love. But by 1670, after the great unification of three Slavic peoples, the crowns have yet another value point to the brotherhood of Belarusians, Ukrainians and Russian. The value of the eagle was also varied, depending on the changes in the history of Russia. But the essence remains the same - eagle is the personification of the greatness of the people, his ability to overcome any obstacles. Two of his heads indicate the unity of two cultures – East and West, its double the wisdom and power point to his tireless vigil over the enemies, on the ability to vision and prosperity. In the era of communism from the coat of arms of the tsarist Russian government has refused to give the symbol of the old regime. But in 1993 adopted a new draft of the Russian coat of arms, which returned the image as a two-headed eagle crowned by three crowns. On the modern coat of arms of the Russian Federation is Golden double eagle is located on a red background, in his paws he holds a scepter and Orb, and his chest protects shield with a silver rider in a blue cloak, striking the black dragon. Three crowns over the heads of the eagle, in the modern political interpretation, have become symbols of state sovereignty, equal troevlastie in the government – legislative, judicial and Executive systems. The emblem is a reflection of the power of the state, its historical path and device type. Heraldry very seriously each element used in the symbols of state power. So, some of the characters become obsolete, they are replaced by other, and part of the rise over time in the same way as it happened with the double-headed eagle on the Russian coat of arms. One of the characters has its own characteristics and history, reflecting the power of the modern state, particularly its devices and areas, of course, is the coat of arms. History of the coat of arms of Russia in the form in which it is presented today, begins with the reign of Ivan III. The appearance of heraldic symbols usually associated with the chivalrous era. The coat of arms is a symbol of-a-kind, its distinctive sign. The uniqueness of the Russian coat of arms that he appeared in such an early historical period in the country who never knew of the knights. In the 15th century, in addition to the image of St. George on the seal of the king, being at that time the main symbol of power, appears headed eagle. The eagle is a sign of continuity, resulting from the fall of the Byzantine Empire and marked the wedding of the great Russian Tsar with the niece of the Byzantine Emperor. It is the eagle was meant to symbolize the absolute power of the monarch. Since then, the emblem was quite a long way and has undergone several important changes. Already in the 16th century the eagle becomes more powerful sounds and is depicted with open beak and tongue, giving it a grown-up and scary. 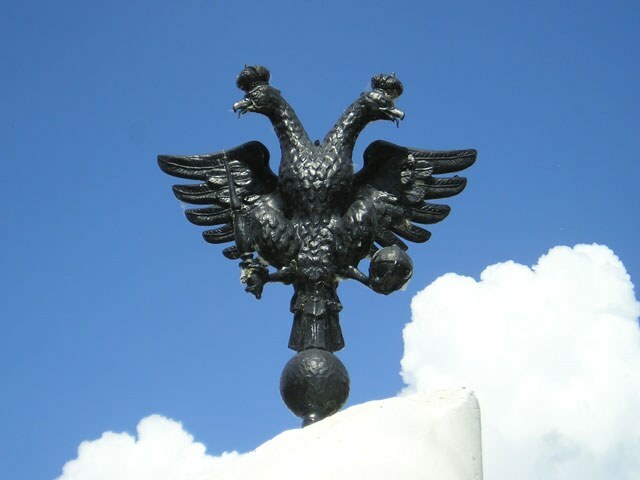 Later, the eagle takes the crown, topped with an Orthodox cross as a symbol of the many military victories and the great accession of Siberia. Eagle is minted on coins and became an army emblem. 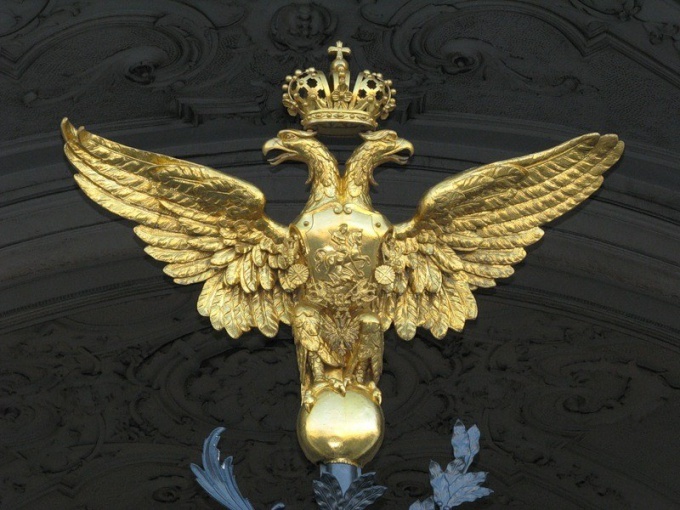 After ascending to the throne of Mikhail Romanov, the Russian state enters into relatively calm and stable epoch of its existence, the eagle begins to be depicted with outstretched wings and a triple crown, signifying the Union of fraternal peoples. The direction for European development in the 17th century began to emphasize appeared in the clutches of the eagle symbols of power: the scepter and Orb. In the time of Peter the two-headed eagle gave a dark color, and replaced the old-fashioned Royal crown on the symbols of Imperial power. And joining Russia in the Far East gave the eagle biceps a whole new meaning, symbolizing the duality of the state and the distribution of power in the West and more importantly, in an easterly direction. Since then, the eagle changed tilt heads have gained and lost a variety of symbolism in a variety of coats of arms, shields, chains, helmets and crowns, and even lost its national importance. The revival of the historic symbolism occurred in 1991 and today, despite its relative prevalence in the heraldry of various countries and States, the eagle in the form of a double-headed creature is rare and very uncommon. In the modern sound is powerful, inspiring respect for the creature underlines the gravity and power of the modern state. Coat of arms, flag and anthem are the three main symbols of the state. Russian coat of arms double – headed eagle is easily recognizable and so widely known that people often do not even wonder why the bird in the image has two heads instead of one. The eagle immediately became a symbol of Russia. First, on the country's coat of arms was a picture of a wild lion attacking a snake, and later it was replaced by a horseman, symbolizing the Emperor. Double-headed eagle became the symbol of Russia in the XV century. This was due to the marriage of Ivan III to Sophia, Princess of the Byzantine Empire. The Russian ruler wanted to emphasize the connection with the family of his wife, however, and to improve its credibility in the world and especially in Europe, so he decided to make a family coat of arms– the double-headed eagle. First, the symbol began to appear on the seal of Ivan III, but later turned into an easily recognizable symbol of the country. However, although this image was widespread and was associated with Royal power, it officially became the emblem only under Ivan the terrible. Of course, in the XV century the coat of arms of Russia did not look like now. Many of the rulers have supplemented it with new features or changed items. Ivan the terrible added to the image of the bird crown with a cross, to emphasize the Royal power. Later instead of one of the crown began to portray three. Moreover, on the breast of the bird appeared the image of St. George. Also, over time the eagle began to add languages that mean independence, strength of Russia, its willingness to stand up for himself and defeat any enemy. With the onset of the time of Troubles the eagle "took" all the signs of power. However, when the hard years passed, the coat of arms again becoming symbols of the greatness: it was supplemented with a scepter and an Orb. Catherine I painted the picture black, and Peter added his Imperial crown and the order of St. Andrew. Later rulers were also a few other changes, but the basis of the modern Russian coat of arms is taken the variant of the double-headed eagle, which was adopted under Peter I. There are several explanations for the strange appearance of the eagle, chosen for the coat of arms of Russia. It is worth mentioning two of the most important religious and political. Double-headed eagle symbolized the God Sharur in ancient Sumer. In India this bird was named Gandabherunda and also had a divine origin. In both cases, the divine creation had such awesome power and symbolized the Supreme power. We are talking about a very ancient image – one of the many matching characters like two-faced Janus. As for the political version, it is simple: for a long time the eagle was the heart of Russia, and its head, looking East and West at the same time, symbolizing the vastness of the country and its geographical position. The image of an eagle is very common in heraldry. This proud bird, a symbol of power and the state vision, is in the state coat of arms of Armenia, Latvia, Georgia, Iraq, Chile, USA. There is an image of an eagle in the Russian coat of arms. 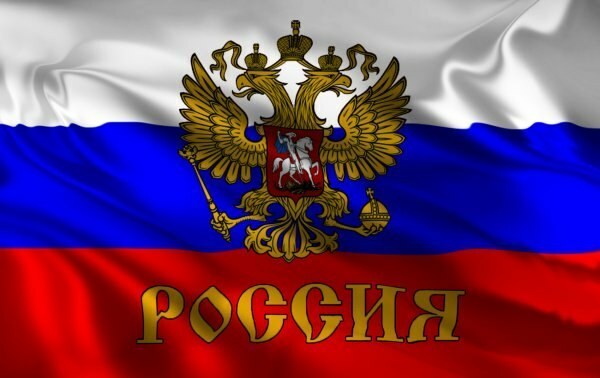 Feature the Russian coat of arms is that the eagle depicted on it that has two heads facing in different directions. This way can not be considered exclusively a Russian – he was known to the Sumerian civilization, the Hittites. He existed in Byzantium. 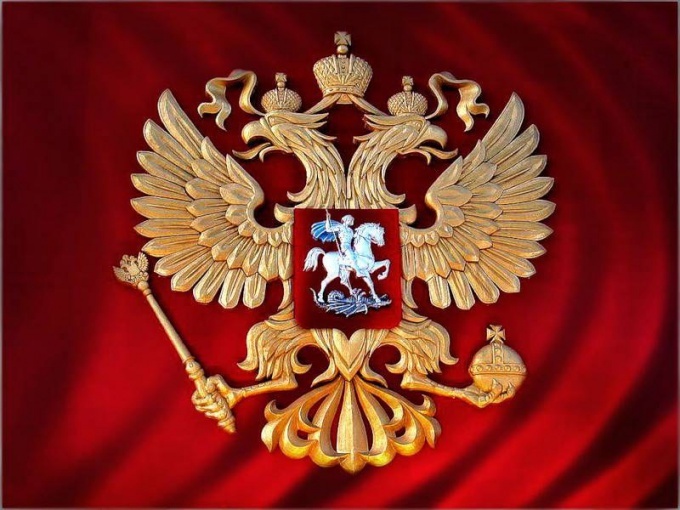 The most famous theory connects the origin of the Russian coat of arms a double-headed eagle from Byzantium. It is believed that this coat of arms "brought" in Russia, Sophia Palaeologus, the niece and sole heiress of the last Byzantine Emperor. Marrying Sophia, Grand Prince of Moscow Ivan III had every reason to consider himself the heir of Byzantine emperors, who died under the blows of the Turks, and, together with the title of Emperor and inherited the coat of arms a double-headed eagle. This hypothesis contradicts many facts. Wedding of Ivan III and Sophia Palaeologus took place in 1472, and the double-headed eagle was adopted as the state emblems (the print) in 1497. It is difficult to find a causal relationship between events separated by 25 years. There is no reason to believe that the double-headed eagle was the emblem of the Palaeologus and especially the Byzantine Empire as a whole. This symbol was not on Byzantine coins, either at the state seals. And yet, this symbol was used as a decor item. Garments with this symbol worn by high nobility. As a coat of arms double-headed eagle was not used in Byzantium and its neighboring countries – Bulgaria, Serbia, Romania, who sought to oppose her. Some researchers have attributed the origin of the double-headed eagle on the Russian coat of arms with the Golden Horde. This symbol is present on the coins of Janibek, who ruled in the 14th century. But this theory is controversial: the borrowing of the enemy's emblem is unlikely. More reasonable seems the hypothesis of borrowing the double-headed eagle of Western Europe. In medieval Europe, the double-headed eagle was present on the coins of Frederick Barbarossa, Bertrand III, the king of Bohemia Wenceslas IV, and from 1434 it was the state emblem of the Holy Roman Empire. Ivan III took a course on strengthening of the international prestige of the young Moscow state. It is measures such as issuing gold coins, the introduction of European elements in the court ceremonial. It is possible that the adoption of the eagle as the emblem was also connected with the desire to become level with the European monarchs, especially Emperor of the Holy Roman Empire. In Europe, the double-headed eagle appeared in the late 12th century – in the era of the Crusades. Probably it was during the Crusades, this symbol was borrowed by the Europeans in the East. In Eastern culture it was conceived in antiquity – initially as an element of the ornament, later becoming a symbol of Royal power. Two heads of an eagle appeared as the adherence to the principle of symmetry, which in Eastern culture was associated with the idea of perfection, which was correlated with the understanding of the ruler as a "model of perfection". As the Russian coat of arms image of the eagle filled with new content. It was seen as a symbol of unification of Moscow and Novgorod, and is currently most often it is interpreted as a symbol of unity of East and West, Europe and Asia in the Russian state.